A painting in Corpus Christi College, Cambridge that is believed to be Christopher Marlowe. 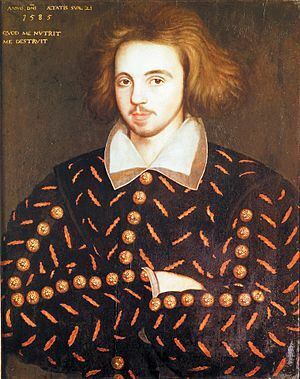 Christopher "Kit" Marlowe (1564–30 May 1593) was a major dramatist, poet, and translator of English Renaissance drama. Many people believe he is the best Elizabethan tragedian before William Shakespeare. Marlowe was the son of a shoemaker in Canterbury. His intelligence won him scholarships, to King's School in Canterbury at age 15, and two years later to the University of Cambridge. Marlowe was well-educated; he earned a bachelor's degree in 1584 and a master's degree in 1587. Marlowe's plays were both very popular and very controversial, in his own era and later too. His plays deal with disturbing subjects like devil worship (Doctor Faustus), homosexuality (Edward II), and anti-Semitism (The Jew of Malta). Marlowe is generally regarded as master of blank verse. In addition to seven plays, Marlowe wrote one long poem, Hero and Leander, and one famous shorter poem, "The Passionate Shepherd to His Love." Marlowe's death was also highly controversial. He was killed in a tavern brawl, stabbed. Yet there is some historical evidence that he was a secret agent. Marlowe also was, or sometimes claimed to be, an atheist, at a time when atheism was a crime that could be punished by death. Some people have wondered if his death was connected with these other issues. Uncertainty about Marlowe's death has led some people to believe that Marlowe faked his death and continued to write plays using the name "William Shakespeare." This is called the "Marlovian theory." The Contention of York and Lancaster (or The First Part of the Contention betwixt the Two Famous Houses of York and Lancaster) is an annoymous work that some people think may have been written by Marlowe. It was the basis for Shakespeare's play Henry VI, Part 2. Marlowe was christened at St George's Church, in Canterbury. The corner of Old Court of Corpus Christi College, Cambridge, where Marlowe stayed during his studies. 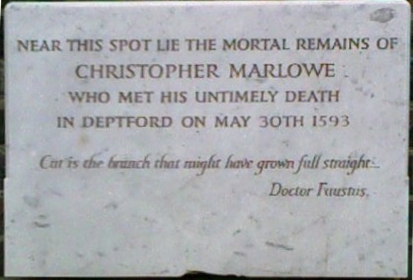 Marlowe was buried in an unmarked grave in the churchyard of St Nicholas, Deptford. The plaque shown here is modern. Christopher Marlowe Facts for Kids. Kiddle Encyclopedia.